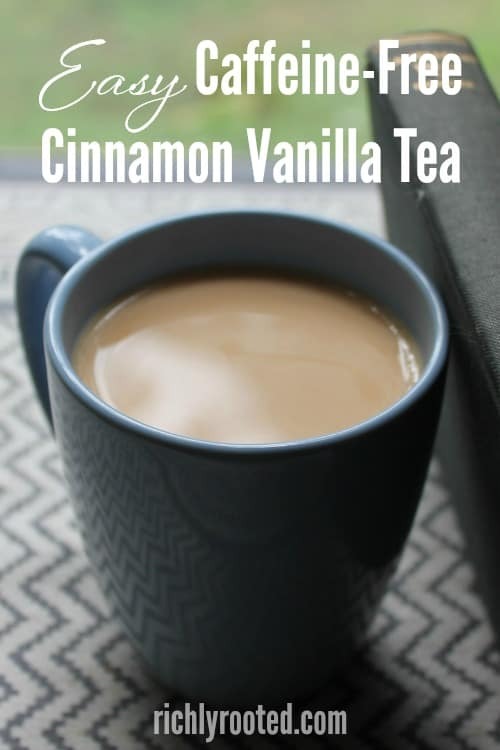 Enjoy a cozy cinnamon-vanilla rooibos tea with this recipe! It’s completely caffeine free, so you can drink it any time of day–and your kids can, too. 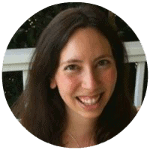 Note from Elsie: My friend Anjanette is guest posting today, while I enjoy my new baby boy and a self-assigned maternity leave! 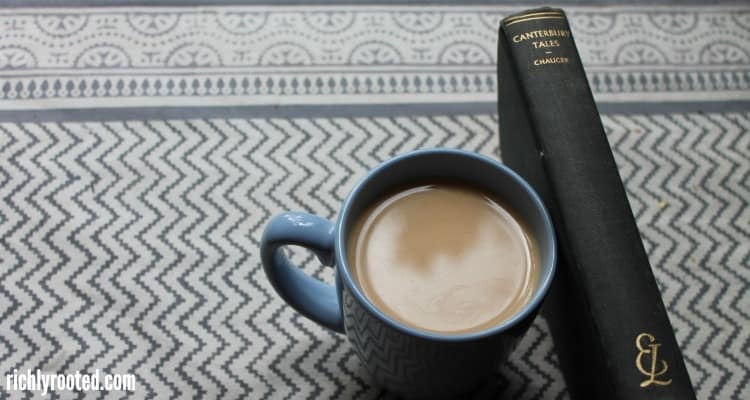 Enjoy a cup of this cozy tea while you read a good book this fall(: For book ideas to pair with it, check out one of the “quick classics” Anjanette recommended over on my literary blog. A hot cup of tea is so comforting! I even enjoy warm tea in the summer when I’m just waking up and anything cold would be shocking, or when I’m ready to snuggle into bed. 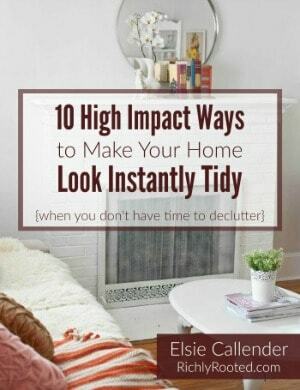 I often find myself reaching for something warm when I want to sit down and organize or brainstorm, and that planning time often gets pushed off until night time after the children are in bed. Caffeine and I have to have boundaries in our relationship. If I’m not careful to limit my caffeine consumption to the morning, I have a hard time falling asleep. I really enjoy sleep. And even though I don’t mind an occasional cup of peppermint or chamomile tea, there’s nothing like a rich tea with cream and honey for a little escape from the crazy pace of my life! So, over the years I’ve tried different tea blends that satiate my craving for black tea, without keeping me awake. 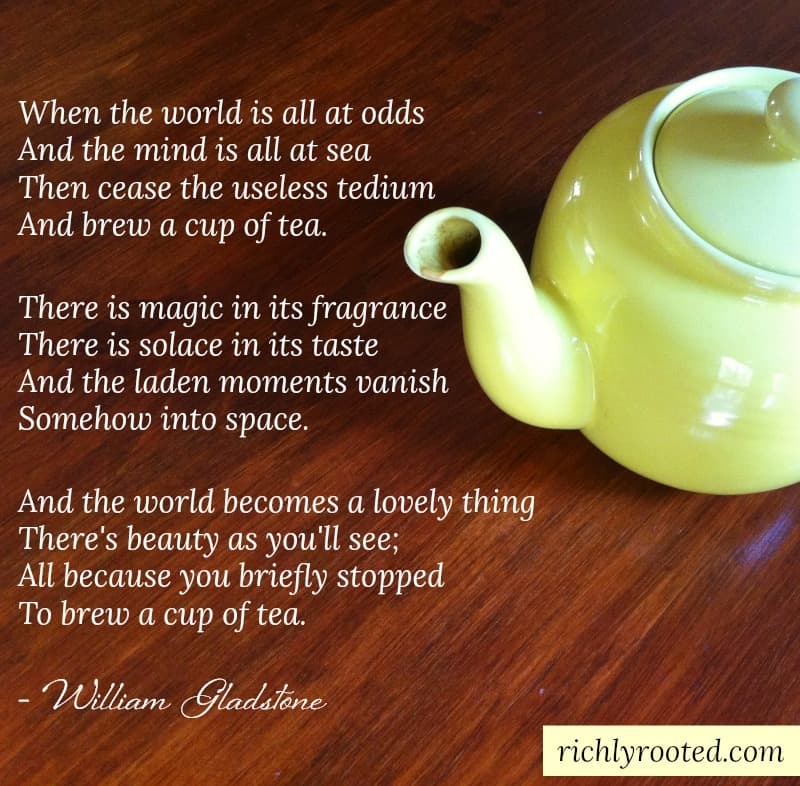 Rooibos has become my favorite black tea alternative. In fact, I like it every bit as much as my daily English Breakfast. Rooibos is also called African Red Bush tea, and it is naturally caffeine-free! It also boasts an impressive lists of health benefits from being extremely high in antioxidants to increasing bone health. My favorite benefit is that it satisfies my late-night hunger! Rooibos is slightly sweet on its own, and has a wonderful flavor without any add-ins. I prefer my tea hot (I do live in Alaska), but it also makes a lovely iced tea. If you’ve tried it plain and are ready to make your rooibos tea a little fancier, I have the perfect recipe for you! I’ve taken to purchasing these ingredients in bulk so that I can have as many cups in a day as my heart desires. My children love it, too! This recipe uses a 1:1:1 ratio, so it’s super easy to measure, double, triple, and remember for the next time! 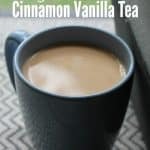 Enjoy a cozy cinnamon-vanilla rooibos tea with this recipe! It's completely caffeine free, so you can drink it any time of day--and your kids can, too. 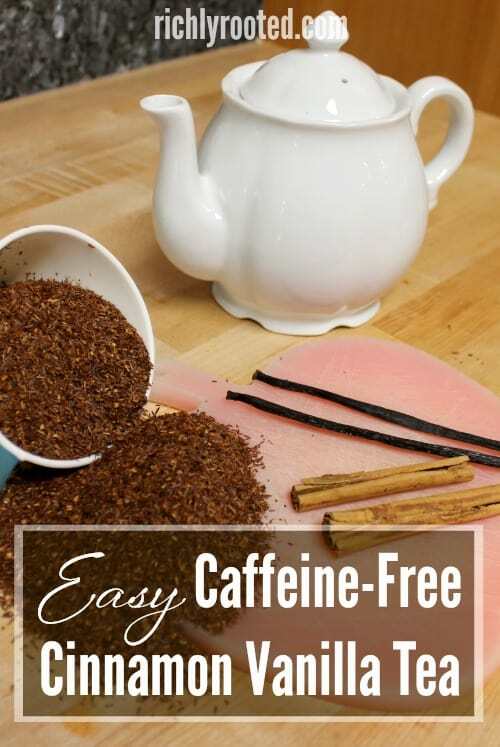 You'll need either a clean coffee grinder (I have an extra that I use just for chopping herbs and spices) or a food processor, and a large bowl for this tea blend. Measure your loose-leaf rooibos out into a large bowl. Make sure there's enough room to stir well after you incorporate the other ingredients. With a sharp knife, chop both cinnamon stick and vanilla beans into sections 1/4 to 1/2 inches long. This will make it easier on your grinder or processor. Pulse cinnamon in grinder until it breaks into small pieces, stopping before it's a powder. Add to rooibos. Repeat with vanilla (stop before it's a paste), and stir well! 1 Tbsp tea blend per tea bag (I love these that iron-close), or infuser. Use very hot (200 degrees) water, and steep for up to 15 minutes to benefit from the full depth of flavor. Drink plain or with cream and honey. Refrigerate for iced tea! Rooibos often comes chopped smaller than black or green tea, so I use the finest mesh strainer I own. Tea filter bags (disposable like those linked above, or reusable muslin/cotton) are great. You can purchase a large bag of loose-leaf rooibos tea online. I haven’t personally noticed any side effects from multiple cups a day, but always talk to a doctor or nutritionist if you have questions. And enjoy!! And for another caffeine-free drink you can sip in the evenings, try Spiced Vanilla Milk!